OK, we’re running a bit behind. We opened the site before we were ready, just to publish a review of a book we all thought was brilliant. Since then, Straight Boy’s gf arrived to spend several weeks, during which she went from gf to fiancée, and he’s been useless since. Sports Boy is off following a baseball team for work (and a player for fun). Arts Boy is in the throes of creativity, and gets thrown food occasionally. I have absolutely no excuses. So as promised, the reviews will be haphazard at best, but we will improve. Murder touched Stephen Dobbins when he was a young boy and left him living in a void of aching loneliness. A chance meeting with a young American chased away the fear that he would always be alone and brought him the prospect of a new existence. Dustin Earl joined the military and escaped his small town Southern upbringing with the hope that he could give his mentally challenged brother a better life. But Dustin had never known real love, an honest hug, or a simple kiss. He considered his sexuality a weakness; a threat that had been used against those he cared about. For eight months their relationship blossomed until Dustin suddenly returned home. He cherished Stephen, but felt his responsibilities to his brother outweighed his own chance at happiness. Shattered, unable to function and unwilling to accept Dustin’s departure, Stephen flew three thousand miles to get Dustin back and rekindle what they had. But what he would learn when he got there… he could never have imagined. In Listening to Dust, Brandon Shire‘s first work since his stunning debut with The Value of Rain, the author once again drives with poetic abandon through the landscape of the heart, ruthlessly plowing through the intersection of love and pain, in this engaging and haunting new work. In London, Stephen Dobbins, whose parents were murdered for mysterious political reasons, meets Dustin Earl, a drunk American soldier with a troubled past and an uncertain future. Dustin’s tour of duty has just finished and Stephen takes him home. Their night together engages Stephen’s emotions but Dustin explodes with anger the next morning and disappears. He returns eventually and begins a tenuous relationship with Stephen that grows deeply over the course of eight months. From the outset Dustin makes it clear that he will, for family reasons, return to his home and eventually does leaving Stephen bereft and lonely. Stephen hides out in France for a year before finally deciding to go to America to bring Dustin back to him. He is unprepared for what he finds in America where an awful irony accentuates the paths that love and pain travel together, where love can not save anyone from death, but death cannot destroy love. Listening to Dust is well worth reading many times. There are no wasted words, no comforting platitudes, no perfect romances just life told by a master story teller with a razored and haunting insight into heart and soul. 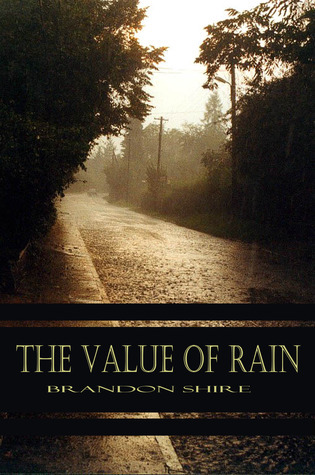 “There are dead people in my head.” From the opening line to last, The Value of Rain by Brandon Shire seizes your heart and does not let go, even long after the book is closed. The story of a family that fuses love to hatred and life to death and rolls those two fusions together, so that it is impossible to ever separate them. Though only a few scenes take place in New Orleans, The Value of Rain echoes the southern gothic tradition, entangled and hidden bloodlines and all. Indeed Flannery O’Connor and Eudora Welty would be comfortable in this world, and would be envious of the writer. The characters are strong in their weaknesses, and their strengths always betray them. A first act of physical love propels a young boy from his already precarious existence into the living hell of a psychiatric hospital for a hideous ‘cure’ for his gayness. Charles’s non-chronological narrative of his journey through that hell, and all that follows, is told with an unerring eye for detail, both physical and emotional. The Value of Rain also shows the strong emotionally warping effect of revenge; given the chance to escape, to just be loved for himself, Charles finds he can not let go of the emotional and deadly pas de deux with his mother Charlotte. This is a lyrically beautiful book, masterfully woven with intense emotion, insightful and frightening in its clarity.